G-AGZB was an ex RAF military transport aircraft. It was built in Santa Monica in 1943 , used by the RAF until demobbed in 1946 and sold to Railway Air Services, the airline arm of the railway companies before nationalization, who used it for passenger work. 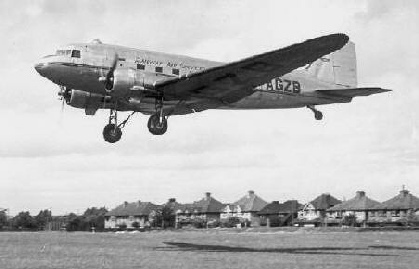 G-AGZB was used until the Dakota was phased out by BEA and in fact completed the last Dakota flight by the airline - at the end of which it ran off the runway while flown by a senior BEA Captain and was badly damaged! There were no injuries apart from pride. One of the passengers had heard about the fog at Elmdon ( Birmingham ) and had asked the Pilot if they would crash. Naturally he answered most emphatically 'no' but had to eat his words. 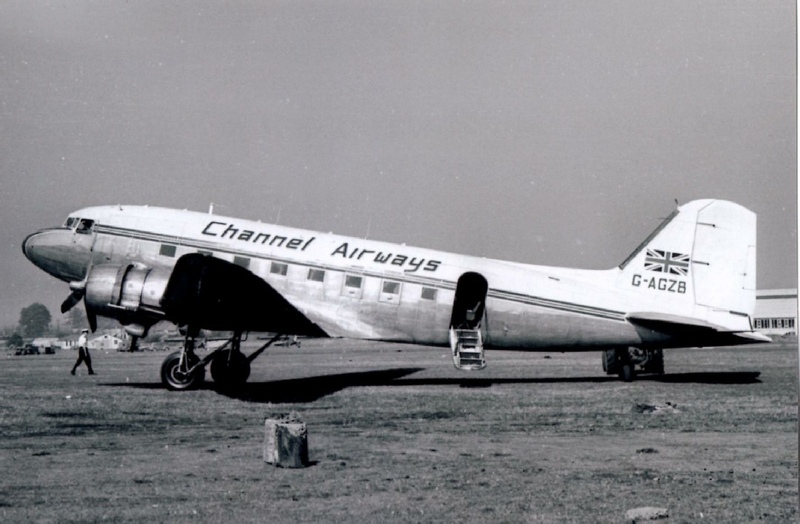 Always on the lookout for cheap planes, Channel’s Managing Director saw a bargain and bought the wreck, taking it to Southend aviation engineers BKS Ltd for a rebuild using parts from another DC3 that had crashed and had an engine fire on take off from Birmingham airport. Rebuilding took over a year, although this may have been done as a 'hospital job' when there was a gap in work schedules. The type was ideally suited to Channel's operations which involved basic airstrips, many with grass runways, where the power and rugged design were a great advantage. Other contemporary airliners like the Dove and Heron were good performers but didn't have the grass strip performance and robust dependability of the DC3. There is a saying in the industry - the only replacement for a Dakota is a DC3. 29 December 1943 - delivered with serial FZ624 to RAF Dorval, Montreal, Canada. RAF Ferry Command. 26 February 1945 assigned to 10 Squadron RAF 1336 TSCU (Transport Conversion Unit) RAF Welford, Berks. OPERATION MARKET with 48 Squadron RAF - air drop of supplies to the Arnhem area. 18th September 1944 Down Ampney to Arnhem for resupply drop. 21st September 1944 Down Ampney to Arnhem for resupply drop. Heavy opposition from flak & fighters. 23rd September 1944 Down Ampney to Arnhem for medical supplies drop. 18th March 1947 Upgraded to BEA ‘Pionair’ specification and named "Robert Smith-Barry" after the pioneer of dual control flight training. 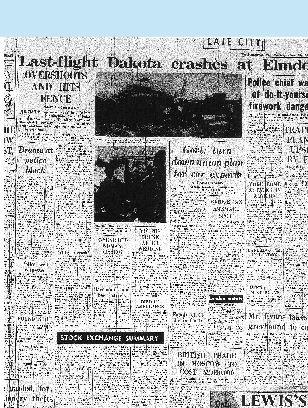 31st October 1960 Crashed in fog at Elmdon Airport Birmingham after making the last BEA domestic Dakota flight. Overshot runway - no injuries. 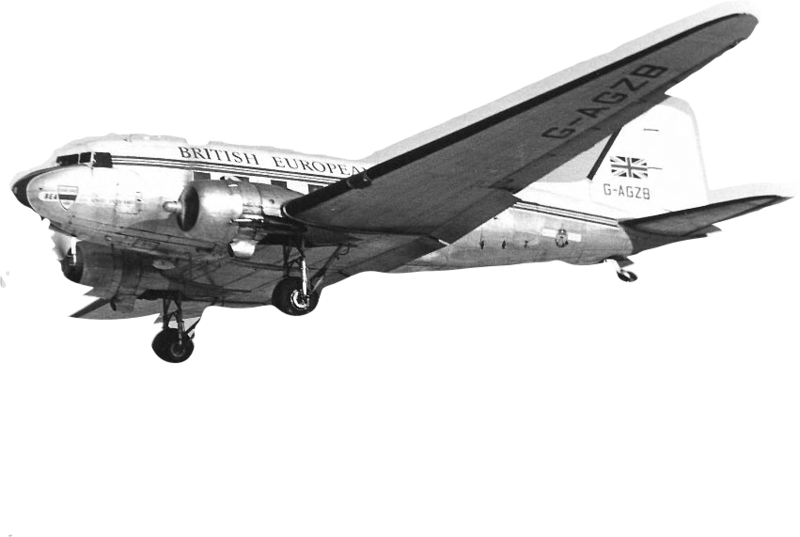 13th December 1960 Purchased in damaged condition by East Anglian Flying Services Ltd ( trading as Channel Airways ). Shipped by road to Southend Airport. Repaired with parts from Don Everard Aviation G-AMSF (c/n 25825) which had been written off in a crash. 6th May 1962 crashed and written off - Ventnor, Isle of Wight.